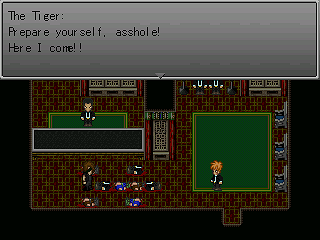 I picked up this game because it had a custom battle system from the German RPGmaker community. Most of the big-name patch makers (Cherry, Ineluki, bananen-joe) are German and I miss the old days of people making systems way too big for RM2K in RM2K. Not to mention the setting sounded intriguing and I don't mind kung-fu stuff, so why not? I wasn't disappointed. The story and writing is everything here. If this game gets one thing right, it's the atmosphere of the source material. It all feels like a nostalgic action movie with the Hong Kong cops, silly martial arts techniques, a tournament, and needless violence. The summary on the main page doesn't do the game justice. Although the writer isn't a native speaker, the characters are all well-written and nothing seems fake. The style is light for the most part and pokes a bit of the fun at the genre while having a lot of fun with it. 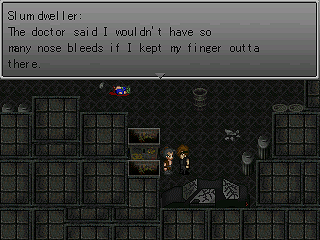 The dialogue with NPCs is good too, and they often have choices or are otherwise amusing. 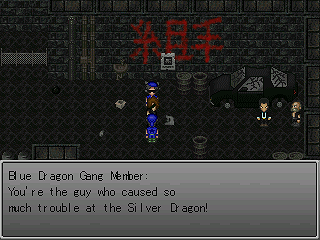 The story follows Bei Mao Xiong, an ex-detective who killed the leader of the Black Snake Triad without a warrant. His wife and daughter were killed in retaliation, and Bei Mao Xiong himself was set up for the murder of his own family. In jail, he masters Hokuto Shinken and sets off to use it to avenge his wife with as many fatalities as possible. The story opens with a very nice cinematic that runs for twenty minutes without becoming boring. 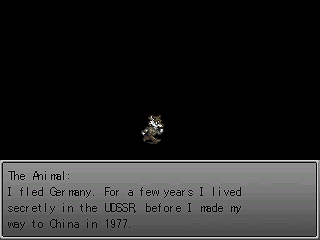 This is also the only game that had auto-scroll text that didn't make me want to hurt myself. Anyway, after the opening, Bei Mao Xiong follows the trail of the Splatterpunk triad into Kowloon, meets a few shady characters, and sets to business. There's a nice tournament along the way too. Hokuto Shinken itself is the greatest thing ever. Did you know there's a power point on your body that will make your chest explode in 5 seconds? Or one that will make liquify every bone in your body after 10 seconds? Or one that will make you automatically walk into fire and die after 30 seconds? Martial arts is an amazing thing. 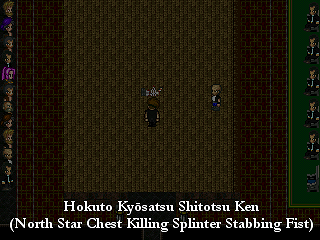 All of these effects and many more are gloriously animated with sprite gore and sound effects. It's pretty damn awesome. The game never takes itself too seriously, and everything's enjoyable up to the very last scene where everything's kind of left hanging. What I thought should be the second to last boss ended up being the final boss, and after that things got a little cheesy. Ah well, I still enjoyed it. There were some pretty great moments. 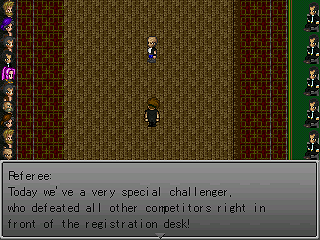 I know what it's like to have a two-month deadline and attempt an ambitious action battle system with RPGmaker2000. This is better than most shots at it, but making something like this is RM2K is hard. Combat is all through a side view system like a cross between a fighting game and a beat-em-up. You have some basic attacks (identical) and a combo, and the enemies have an attack. Your range is identical, so you'll have to use skill to win... in theory. In practice, battles are pretty broken. In RM2K, as soon as an event starts moving to a square, it counts as on that square. This means that enemies stepping up to you can attack the split second they get in range. As attacks have zero startup, not enough cooldown to punish, and very limited range, it's almost impossible to take down an enemy by moving in. Although you might think the spatial distance between two fighters is 2.5 tiles, if both fighters are stepping towards each other, they can hit each other. So basically it feels like the attack range is inconsistent. The AI, however, does not get confused by this and often punishes approaches. You might think this would make combat hard. Actually fighting is pretty easy if you have the patience for it. By pressing S-S-D you get the unblockable attack. As enemies are always blocking, this is about the only way to hurt them. 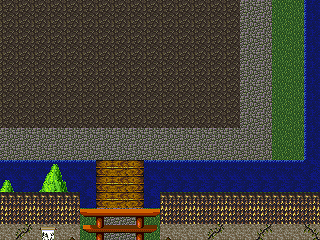 There's also a bug that buffers attacks, so that if you mash D twenty times, twenty kicks will eventually come out. Most of my strategy consisted of mashing SSD a hundred times, thereby storing up 100 super attacks, and then rushing straight into the enemies while my character automatically kick punch punched at lightening speed. Well, that sounds fun, right? Actually yeah, it was pretty fun for a while. However, when bosses started to be able to take out 2/5 of your health with one hit while having 10 hits themselves, this stopped working. Because there's no hitstun/knockback everything has superarmor, so even while rapidkicking a boss's face in, they'd just land a punch or two and then you're dead. Instead, the best strategy was to hide in a corner. Because you can't face up or down in fight scenes and attacks don't hit immediately above/below the fighter, blocking in a corner makes you invincible. But I didn't block, I just mashed the unblockable combo and waited for the AI to walk into the attacks, which they did, slowly but surely. I'm sure this is how kung-fu works. I'm not sure it's even possible to build a decent fighter-esque battle system in RM2K. The tile limitations simply make attack ranges too variable, and that leads to the need for dumb tactics to survive. If someone (the creator?) could post a video of how you're supposed to fight these guys without breaking the system, I'd be interested. There were also a few weird things that happened with projectiles (knives, shotgun blasts) appearing at the bottom of the screen and zooming across as well as some kicks hitting enemies who were way out of range, but nothing horribly broken. 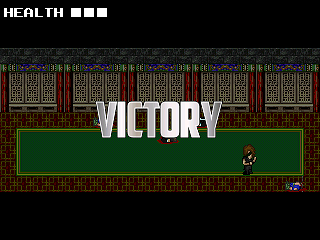 I'd count this as a successful tech demo, but it's definitely the weakest part of this game. Graphically, the game is pretty nice. The graphics are rips for the most part from a couple different games. Most of the time there aren't any issues, but certain things definitely stand out. 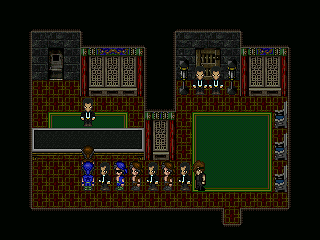 The protagonist's sprite has a shadow while others do not, for example, and your Japanese prostitute gal just doesn't quite fit. The custom stuff is pretty nice even if it's obviously home-made. The graffiti, coke machines, and helicopter are all appreciable. Mapping is... okay. Some areas are very detailed and others are not. The slum maps are especially nice, with a variety of NPCs and space to wander around. It's a shame there are only two or three of them. In other places, the map feels kind of cramped. For instance, there's a skyscraper roof-to-roof scene with a great panorama that's only 30*15 or so. The first couple maps had be worried though... It also doesn't help that there are a couple of tile pass-through bugs where you can walk through a certain slum brick wall and a few other objects. Good and fitting. The background music in the RPG explore-the-town parts is RPG-like and setting appropriate and during the battles and cinematics, it's straight from a kung-fu movie. Thank the key patch for the MP3 music. Sound effects are alright as well. There's one particular scream that's nice in an over-the-top way, but for some reason there was no sound during the battles, which would've been nice to have. This game was enjoyable and fun to watch/play. The lack of polish on some systems, battle in particular, is understandable because of the contest deadline, and overall, I can definitely see why this game was the winner. I'd recommend it to anyone looking for a nice story who doesn't care too much about battles. If the battle system was fixed (it'd be hard) and the maps/graphics mopped up a bit, this game would definitely merit a higher score. Ha, but Hokuto Shinken is too badass not to like.